A new Tolkien book is on its way. And by "new" I do of course mean "old" (Calcuttagutta is not in the habit of celebrating newfangled monstrosities; heaven help us when the new Hobbit film comes out). The big news this time around was the announcement by HarperCollins of the release date (23 May 2013) of a new work by J.R.R. Tolkien. 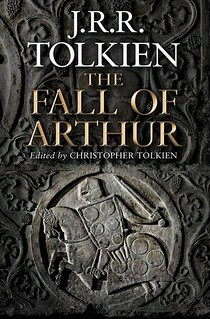 The Fall of Arthur is described as "a work of narrative verse begun by the author before he wrote The Hobbit" (The Bookseller 12/10/2012, p.13). Multiple translations are planned, though "film rights are not being sold". Further details from HarperCollins state that this work recounts the "last campaign of King Arthur", summoned back to Britain from the "threshold of Mirkwood". The new book includes commentary and essays by Christopher Tolkien, who edited the work for publication. The press release from Houghton Mifflin Harcourt (the US publishers) includes a quote from Christopher Tolkien. six thousand spears to Sunlending. It is well known that a prominent strain in my father’s poetry was his abiding love for the old ‘Northern’ alliterative verse, which extended from the world of Middle-earth (notably in the long but unfinished Lay of the Children of Húrin) to the dramatic dialogue The Homecoming of Beorhtnoth (arising from the Old English poem The Battle of Maldon) and to his ‘Old Norse’ poems The New Lay of the Völsungs and The New Lay of Gudrún (to which he referred in a letter of 1967 as ‘a thing I did many years ago when trying to learn the art of writing alliterative poetry’). In Sir Gawain and the Green Knight he displayed his skill in his rendering of the alliterative verse of the fourteenth century into the same metre in modern English. To these is now added his unfinished and unpublished poem The Fall of Arthur. I just need to forget that HarperCollins is owned by Rupert Murdoch. Again. Also, where is the Beowulf translation I was promised, dammit? Is it so wrong to make movies out of books? Depends entirely how you do it. I don't think I've read any of Tolkien's non-Middle-earth stuff. Perhaps I should.